Planning is half the fun they say, and they're right. Because it's one thing to sit at home on your laptop google mapping your next incredible destination, and it's another thing to actually ride your bike through wind and rain to get there. Sometimes, planning can be even better than traveling. ​But plans will always change when it comes to long-term travel. Now that we are on the road, we are at the whims of the travel gods, and we must surrender to the flow, including ditches and detours. The following is a general recap of our trip so far, with original plans, how things have changed, and our ideas for the future. We will briefly point out how we kept to our budget (or if we busted it), any safety concerns we encountered, and how long it took us for each region. The top starts at the beginning, and at the bottom are route plans for the future. Tim and I at the Grand Canyon, Arizona, U.S.A. Original Plan for the United States - The US has an incredible array of things to offer the motorcycle adventure seeker. But it's also very expensive. So we made a short list of things we would like to see, including the Grand Canyon, Highway 1 on the Pacific Coast, and a few places we'd like to revisit from our Maiden Voyage. We wanted to journey through the States cheaply and quickly, for as long as the summer weather allowed, then head south to Mexico. What about the great and beautiful country of Canada, or going to Alaska? Well, we definitely want to visit these places by motorcycle one day (though it would have to be summertime). But for now, we set our sights on the warmer areas of the Americas. Though we're from Chicago, we technically left on our trip from Tim's brother's house in southern Illinois on Aug. 21, 2017, the day of the solar eclipse. 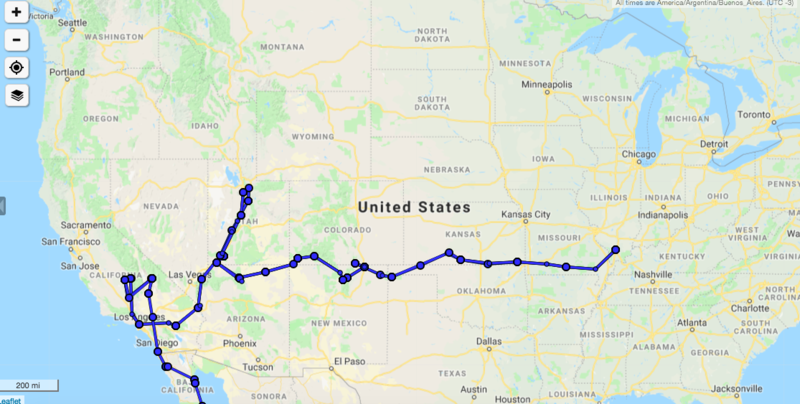 Update for the US: We have completed our US adventure, starting in the Midwest where we're from, and then heading west through Missouri, Kansas, and Colorado. 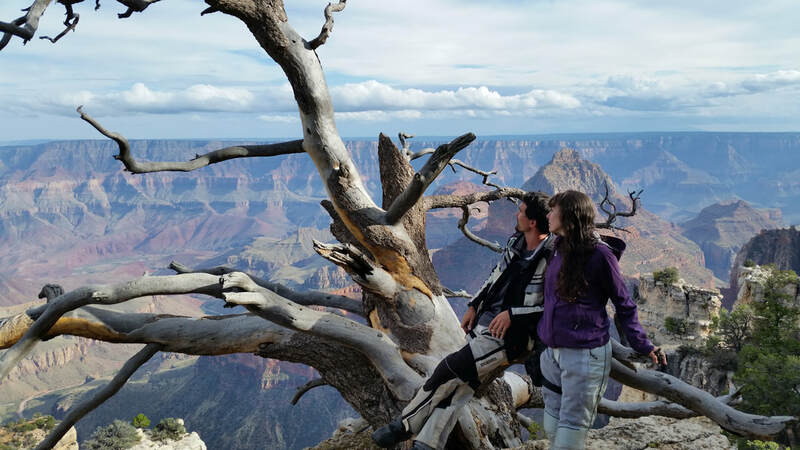 We had some great wild camping experiences in the Rockies (complete with fearing we would be eaten by bears), thoroughly enjoyed the rugged beauty of the Southwest (visited the Native American sights of Taos and Mesa Verde), and got to peer over the edge of the Grand Canyon in Arizona. We briefly went north into Utah, completing our checklist of visiting Utah's five national parks, and stayed with friends near Salt Lake City. But as it began to snow, we headed south again, and unfortunately were unable to take Highway 1 along California's Pacific coast due to road closures. 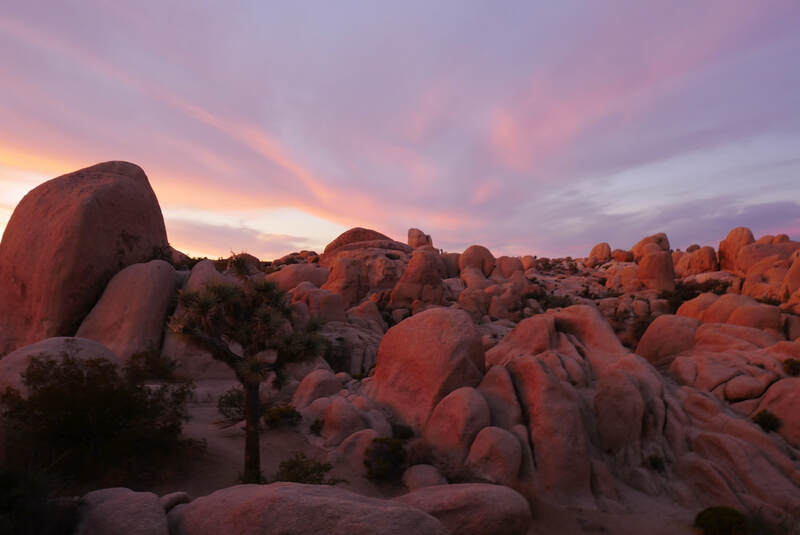 Yet we were able to see some impressive trees at Sequoia NP, and other interesting trees at Joshua Tree NP, then took a peek at downtown L.A. before going south to cross the border at San Diego into Mexico. Budget, Safety, and Timing in the US - We often used freecampsites.net and saved money by camping for free, especially in the plains states. But by the time we got to California, free campsites were nearly impossible to find or did not feel safe due to the type of clientele that would stay there. So we did end up dishing out a lot of money for National Park campsites and a few hotels, but they were all enjoyable. We spent less than two months in the States, right on schedule. Original Plan for Mexico - By entering Mexico through Tijuana, we wanted to traverse down the peninsula of Baja California, then take a ferry to Los Mochis on the mainland. From there we wanted to see Copper Canyon, meet our friends near Guadalajara, and then make sure we saw Mayan ruins wherever they were. We were rushed through certain parts of Mexico, which meant that even though we saw a lot, there is a lot we missed. 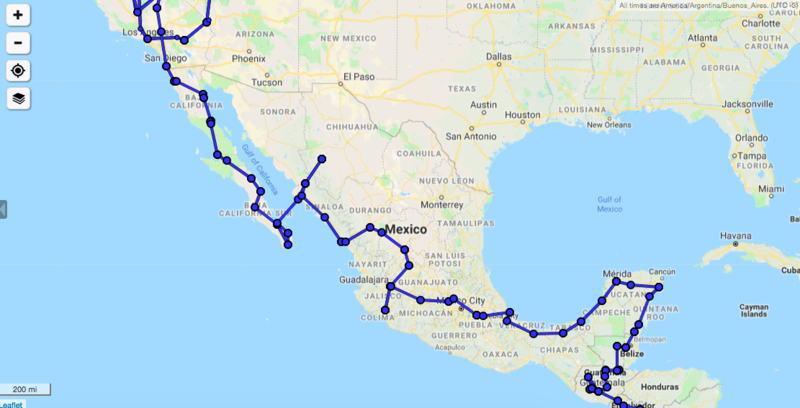 Update for Mexico: We stuck to our original plan pretty well by having many lazy days camped on the beaches of Baja, we stood on the edge of Copper Canyon, and stayed with our friends in Colima. But when Tim's family made a plan to come visit us in the Yucatan for Christmas (it was amazing, full of Mayan temples and swimming in cenotes), that meant we had to rush across the entirety of Mexico to get there. So we missed some incredible places, but we figured that Mexico is so huge and diverse, we'll always have something to go back for. 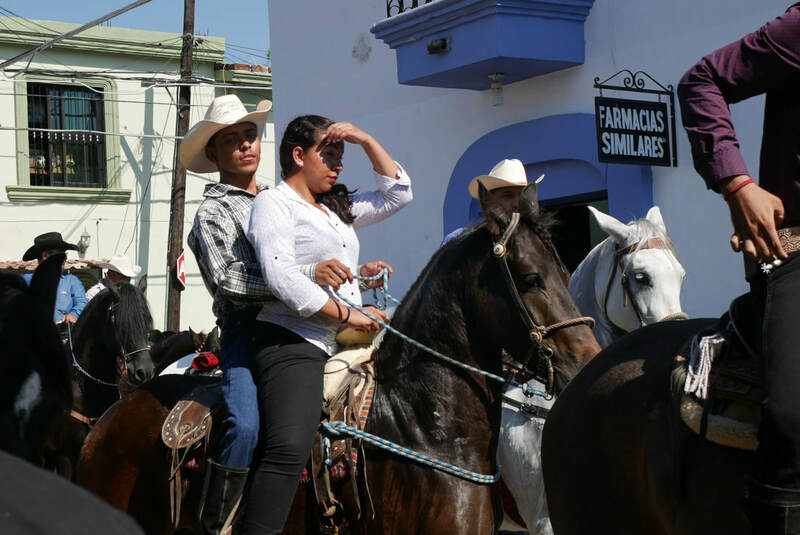 Locals in a horse parade in Comala, Colima, Mexico. Budget, Safety, and Timing in Mexico - Everyone always says Mexico is dangerous, and maybe we were just lucky, but we only met friendly and welcoming people there. That being said, in all our travels in the Americas, corrupt police pulling us over and wanting bribes were the worst in Mexico. It is a very budget-friendly country, besides having to constantly pay for expensive tolls (you can always take the free roads). We stayed three months, a bit longer than expected, but it was worth every moment. Me (Marisa) snapping a picture of the incredible volcanoes around Lake Atitlán, Guatemala. Original Plan for Central America - Because my profession had been to teach English to students from Central America, I was acutely aware of the gang violence that plagues countries such as El Salvador, Honduras, and Guatemala. So we planned on sticking to main roads and zipping right through. 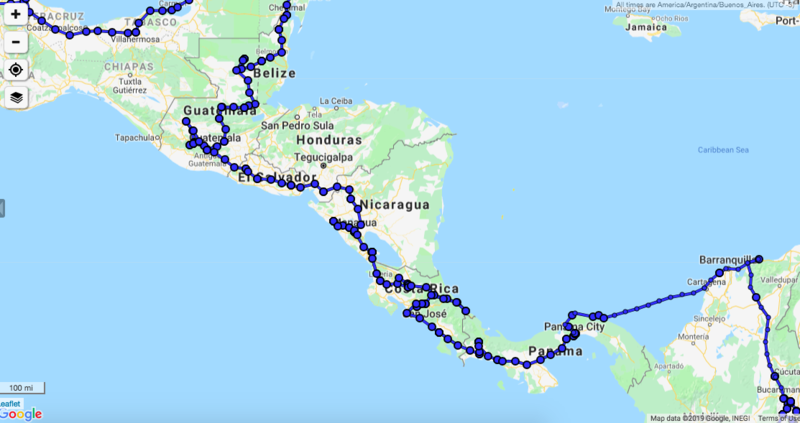 And assuming we felt safe in a place, we wanted to spend time exploring the volcanoes of Nicaragua, the rainforests of Costa Rica, and then finally we wanted to put the bike on a sailboat from Panama to Colombia to cross the Darien Gap. This was our route through Central America, including our boat trip to Cartagena, Colombia. Update for Central America: We have now officially visited every country in Central America and spent way longer there than we thought. 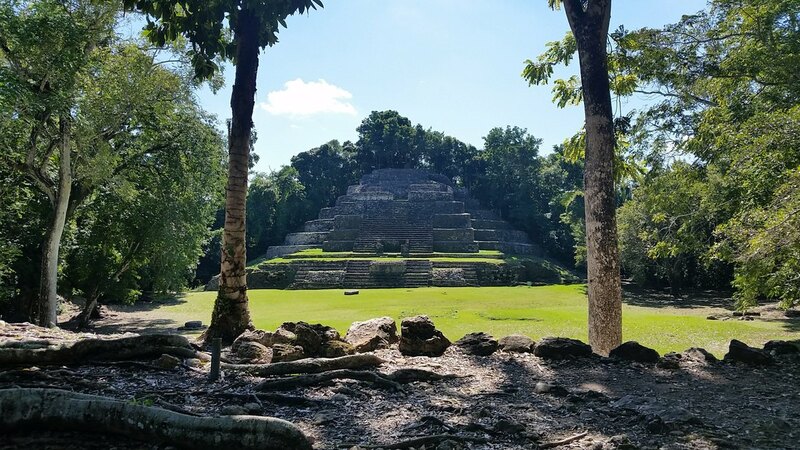 We were so inspired after seeing the Mayan ruins of Mexico, that we went to visit a few more in Belize, then completed our Mayan adventure with the temples at Tikal in northern Guatemala. And to my surprise, we felt Guatemala to be safe enough to stay and explore, which we did: waterfalls, caves, and colonial cities. Due to some political turmoil at the time, we zoomed through El Salvador and a tiny portion of Honduras, then had a blast “volcano-boarding" in Nicaragua and spotting sloths in Costa Rica. I even got to complete my dream of sailing for five days through the Caribbean from Panama to Colombia. And I now know that I get really seasick. The Jaguar Temple at Lamanai, Belize. Budget, Safety, and Timing in Central America - Costa Rica was the most expensive country of the region, but everywhere else was very good to our wallets. Safety was a big concern for us, which is why we spent very little time in El Salvador, and because of protests over the election, Honduras as well. Looking back, I wish we had braved it a bit more because other people didn't listen to the news and had a marvelous time there. Nicaragua felt completely safe while we were there, but not a month after we left, it spiraled into political disarray and was even shut down to tourists (though Nicaragua is supposedly now back on its feet). We spent 3.5 months passing through the entire region, and I think it was here that we began to realize that we wanted to travel about twice as slow as we had originally planned on. 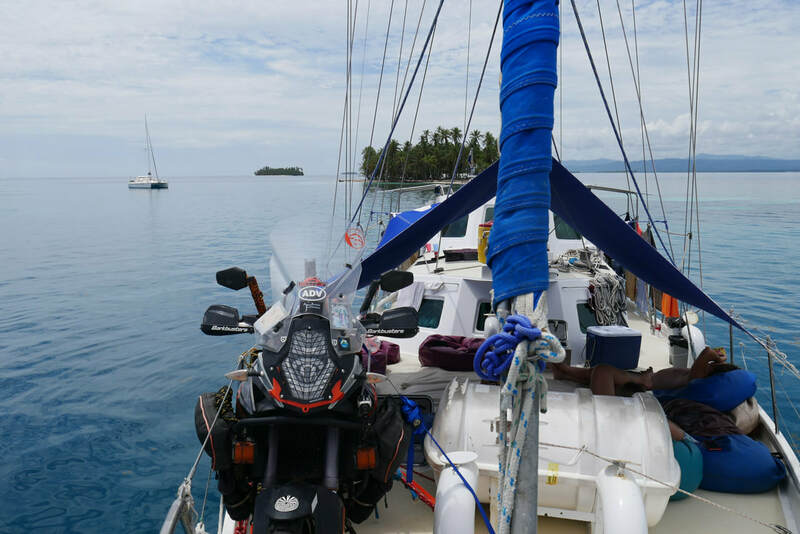 We strapped the bike onto the Wildcard Sailboat as we crossed the Darien Gap between Panama and Colombia. Original Plan for Colombia and Ecuador - By taking a boat from Panama to Colombia to circumvent the Darian Gap (the roadless portion of the Pan-American Highway), we wanted to ride through Colombia, though we had no real idea of what we wanted to see, then enter Ecuador and hopefully find ourselves surrounded by some beautiful Andes mountains. Besides that, we didn't have much of a plan. 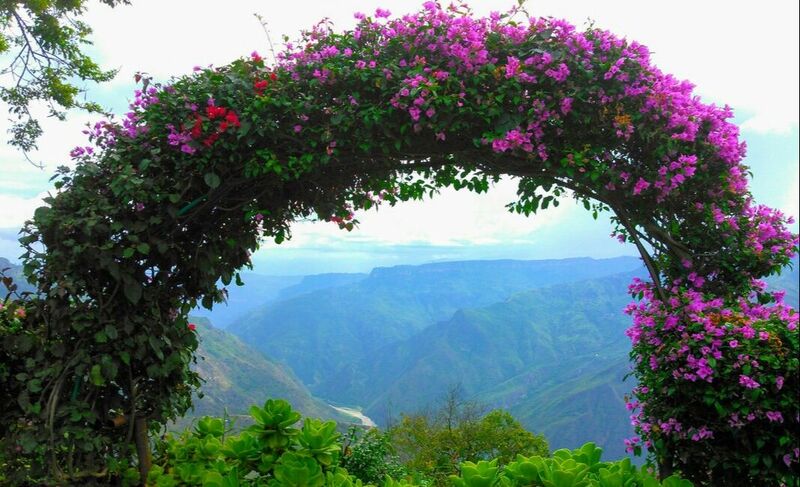 The view of Chicamocha Canyon in Colombia. 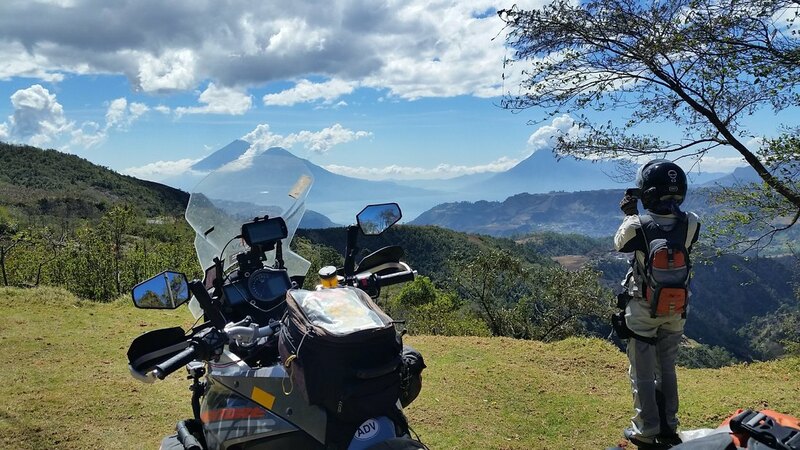 As you can see, we definitely enjoyed ourselves making loops around Santander and Boyacá provinces in Colombia. Update for Colombia and Ecuador: Despite its not-so-great reputation, Colombia turned out to be a paradise of friendly people, gorgeous scenery, and we did not feel unsafe at any point in time. In fact, we might not have ever left Colombia if it wasn't for our date at a Horizon's Unlimited event in Ecuador where we were giving a presentation. 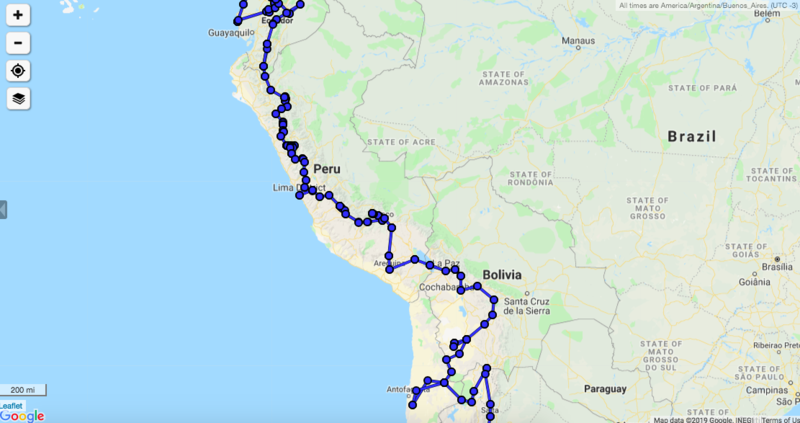 And because of the fantastic people we met there, we had a wonderful time in Ecuador seeing whales and exploring Andean villages with fellow motorcyclists. Off-road with friends near Quilotoa, Ecuador. Budget, Safety, and Timing in Colombia and Ecuador - Colombia was incredibly cheap, but Ecuador uses US dollars and got pricey. Ecuador is also considered to be safer, but we didn't have a single safety concern in Colombia, whereas we did get pickpocketed in Ecuador (they stole Tim's phone in Quito). As far as timing, we could've seriously spent an eternity in Colombia, but as we had to meet a deadline, we only stayed there 2.5 months. On the other hand, I felt satisfied and ready to leave Ecuador after a month, but ended up staying an extra month in total because we needed bike repairs done. 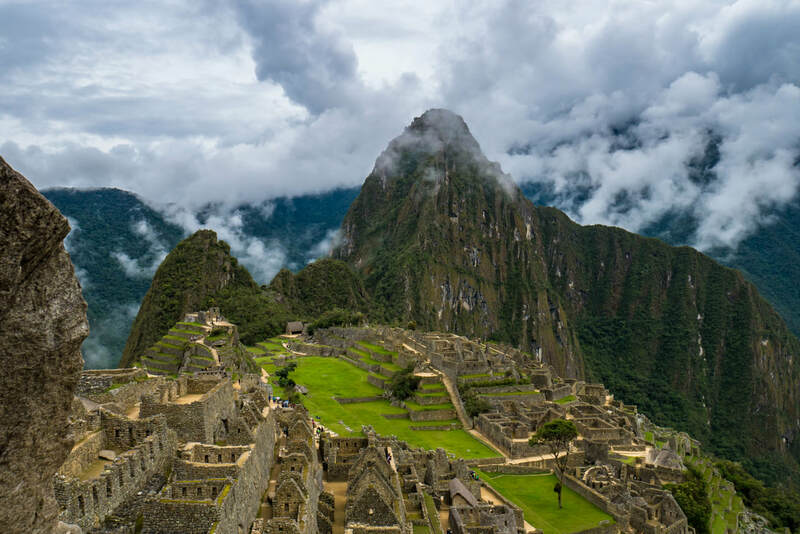 Original Plan for Peru and Bolivia - All we knew for Peru was that we wanted to see Incan ruins and Andes mountains, and that Machu Picchu was a must. 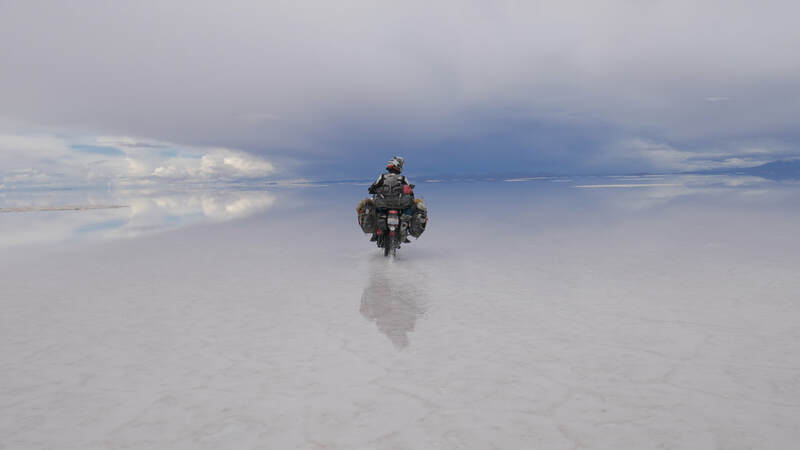 For Bolivia, we had heard about people riding across the salt flats, and there was also something called “Death Road" which sounded interesting. But Bolivia had an added problem for us since Americans have to pay $170 dollars each to get the visa, so we weren't sure Bolivia was going to make it into our future. 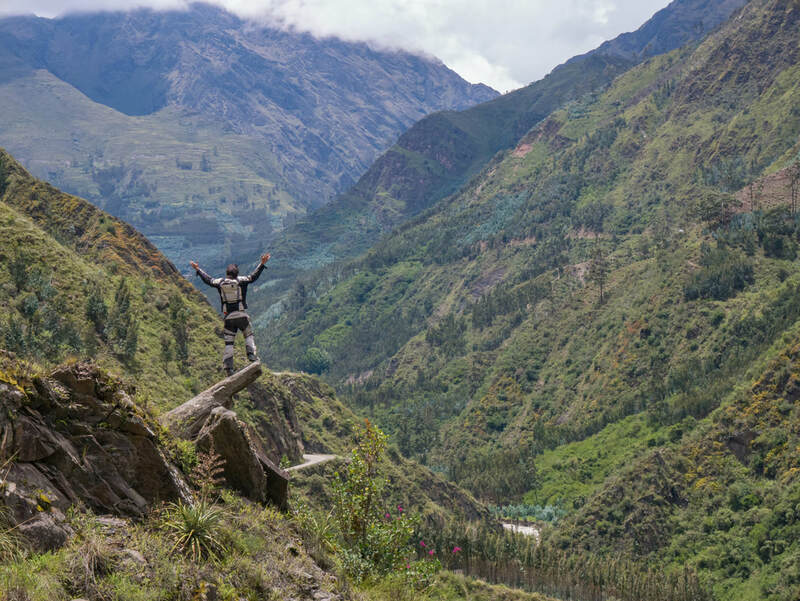 We stuck to the mountains as much as possible through Peru, weaving back and forth down twisty roads for months. Riding through Bolivia's salt flats while they were wet was incredible, but definitely not good for the bike. Update for Peru and Bolivia: We really did complete our Incan dreams in Peru by visiting every single ruin we came across. We also stayed mostly on the difficult and remote roads in the mountains, which was rewarding, but meant we fell a lot (I, Marisa, hurt my foot hear Huaraz). We also missed coastal ruins and sites such as the Nazca Lines. But we did decide that getting the visa to enter Bolivia was worth it, and I'm so glad we did, because we had a blast going down “Death Road" (which was not that scary) and the salt flats. Budget, Safety, and Timing in Peru and Bolivia - Bolivia and Peru were the cheapest countries we visited in South America, with Peru just barely taking first place for budget-friendly. 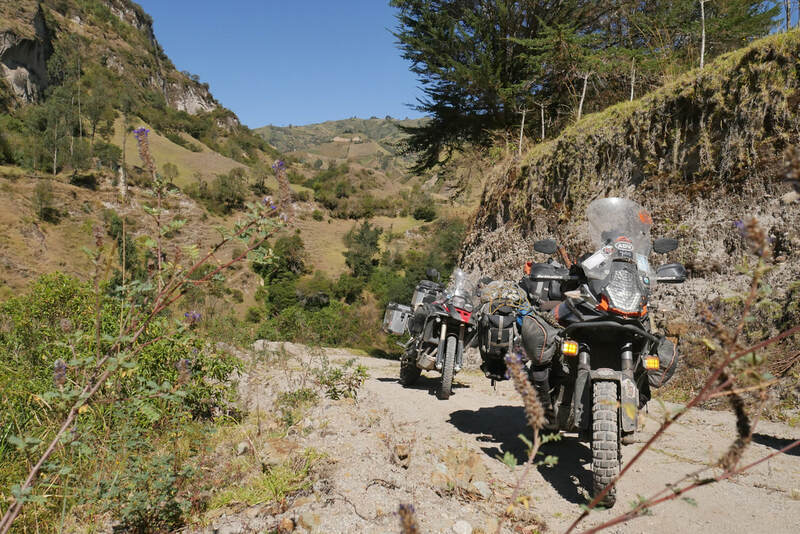 But the amenities and safety standards in these countries was sorely lacking, and I felt that Peru and Bolivia were the most dangerous countries in the Americas to ride through because of crazy drivers and poor road conditions. I (Marisa) ended up hurting my foot in Peru and had to be on crutches for more than a month, so that brought our total time in Peru to three months. Our visa for Bolivia was only 29 days, so we had to rush through and almost didn't make it out on time. 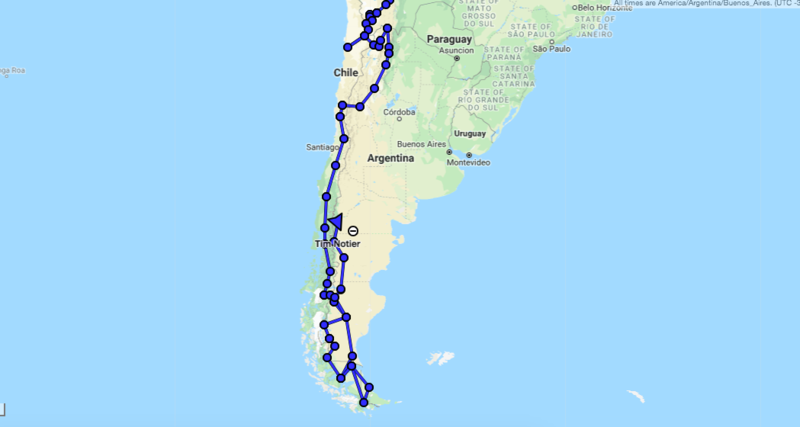 Original Plan for Chile and Argentina - We knew we wanted to zig-zag along the Andes mountains between the two countries and see glaciers while camping in gorgeous valleys. But because of the cold at the extreme end of Patagonia, we had no plan of going to the very end at Ushuaia in Tierra del Fuego, and instead wanted to cut across to Buenos Aires, or possibly end up in Montevideo in Uruguay. Riding up to Fitz Roy, Argentina. So we did end up going to the tip of the continent! And yes, it was cold, but amazing. Update for Chile and Argentina: At the time of writing (Mar. 2019), we are in the middle of Argentina making our way to Buenos Aires where we will end our South America tour. And surprisingly enough, we did go all the way down to Ushuaia because of recommendations from friends. And it was definitely cold, but worth it to be at the southern-most point you can get to by road. Also, we got to see penguins! In northern Chile we drove across the Atacama desert, saw incredible constellations at a planetarium, and in northern Argentina we camped out in barren desert-scapes, then ate grapes at vineyards. In southern Patagonia we visited glaciers such as Perito Moreno, and stunning snowy mountains like Torres del Paine and Fitz Roy (El Chaltén). "La mano del desierto", a.k.a. 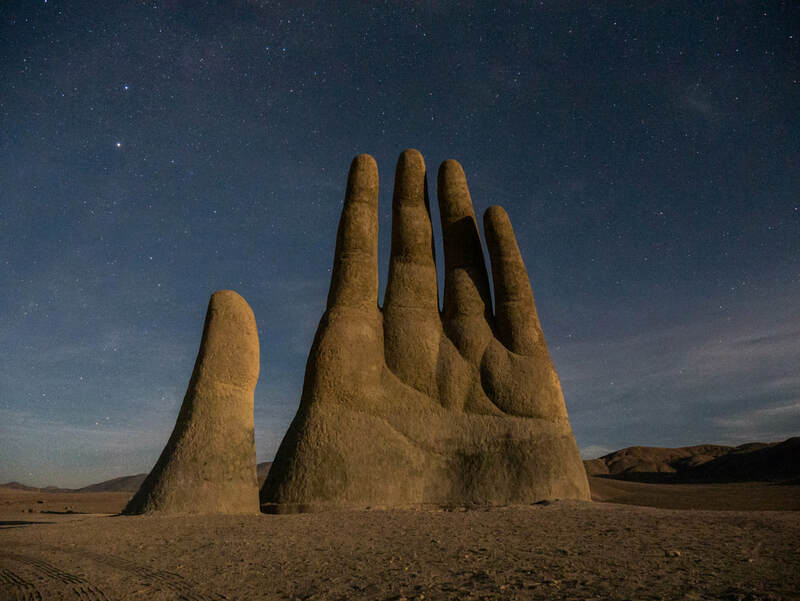 hand of the desert near Antofagasta, Chile. Budget, Safety, and Timing in Chile and Argentina - Both Chile and Argentina are generally very safe (big cities can have their crime though), but the real problem is expense. Chile is particularly expensive for lodging, camping, but mostly for food, and you don't get much for your money. We definitely busted our budget in these countries, and when we needed bike repairs in Patagonia, we were stuck spending a small fortune to stay in hotels while waiting for parts. Northern Argentina is the cheapest area of the region, and wild camping is safe, ubiquitous, and the most affordable way to visit these countries. Our Plan for Africa - To be honest, the thought of riding from South Africa all the way north to the Mediterranean is both thrilling and terrifying for us. Hyenas, malaria, killer bees... all sorts of bizarre images pop into my head when I think about it. Our general idea of how we plan to cross Africa. And then there are the terrible roads I've heard so much about: the only arteries to get through the heart of Africa, crisscrossing through countries riddled with political upheaval and sometimes civil wars. 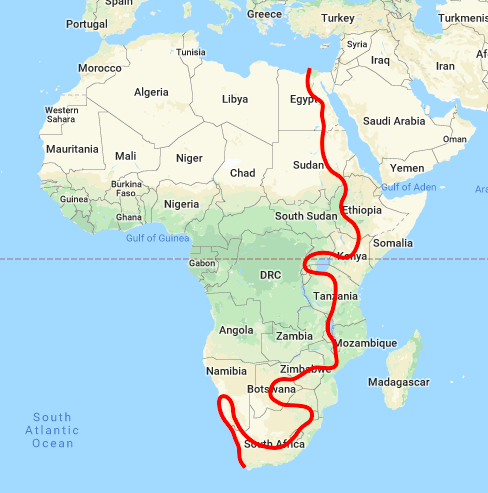 We want to take the eastern route through Africa, starting in South Africa and ending in Egypt (though Egypt all depends on the cost of the Carnet). 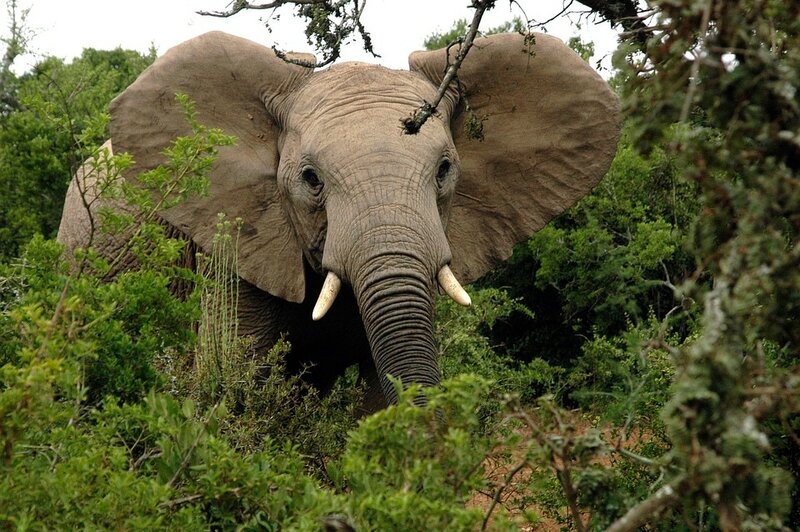 I would also like to visit Namibia's Skeleton Coast before going east, then hitting Victoria Falls, Kilamanjaro, Ethiopia's underground churches, the Pyramids of Giza, and hopefully seeing some wildlife along the way. If you have any advice, suggestions, or contacts within the continent of Africa, we would love it if you let us know here, as we feel we are flying by the seat of our pants. Europe - Crossing Europe by motorcycle is like a fairy-tale dream for us, but it's expensive. And considering we will probably be on zero funds by the time we get there, it may be a good place to stop traveling for a while and pick up a job. 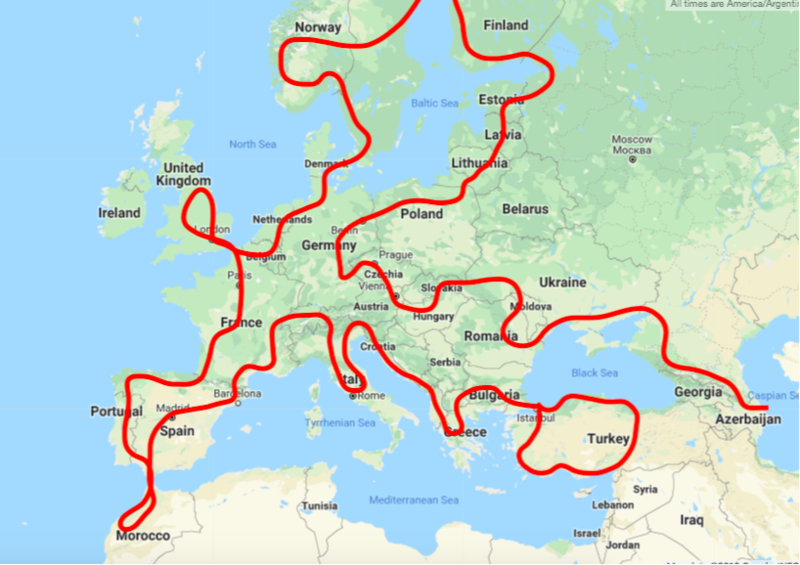 But assuming we have enough money to properly travel, we would like to make a very squiggly loop around the continent, first taking the southern route and then the northern one on the way back, or vice versa depending on the seasons. We have a few friends in Europe to see, including our friend Christian Vogel in Germany who inspired us to take this trip in the first place by making his own round-the-world expedition. He even made a movie about it! ​If you happen to live to in Europe and would like to meet a pair of motorcycle travelers, let us know! When it comes to Europe, we would love to see it all, as this spaghetti line clearly shows. It's really difficult to talk about Asia at this point in time since so much may change between then and now. 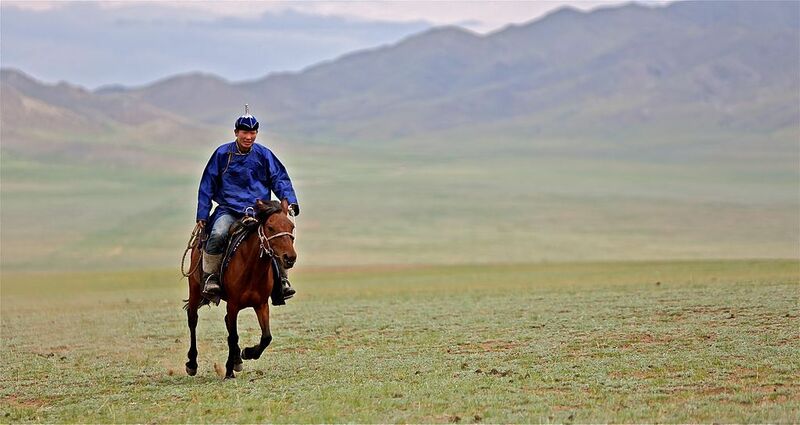 At the moment of writing, it looks like we may have to bypass certain places in the Middle East (for now), but we'd love to ride through Central Asia, the Himalayan region, Southeast Asia, and though China is currently expensive to visit via motorcycle because of government red tape, we can always still hope that things will change. And then what? Japan? Australia? Yes! New Zealand? Yes, yes! But from where we're standing now, these all seem like pipe dreams. Then again, this whole trip seemed like a pipe dream two years ago before we started, and here we are having completed the Americas. So I can only hope that one day we get there. If you have any ideas for us on places to go and roads to take, please drop us a line. 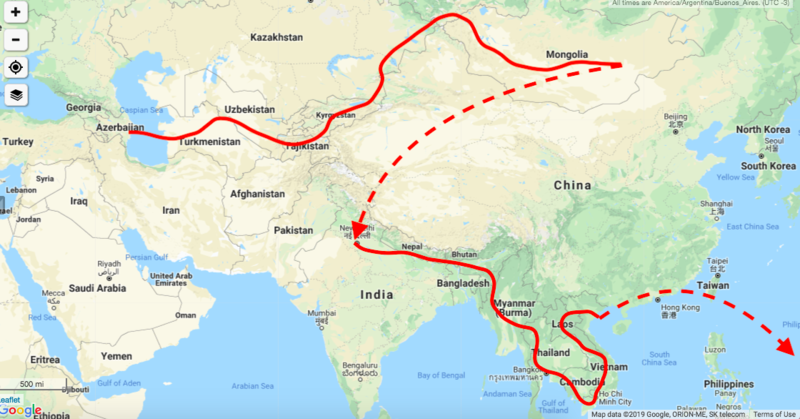 We really have no idea how to traverse Asia by motorcycle, but if I had to make a current guess, this would be it (with flights involved). Want to support our journey? Donate and you'll get Tim's book!